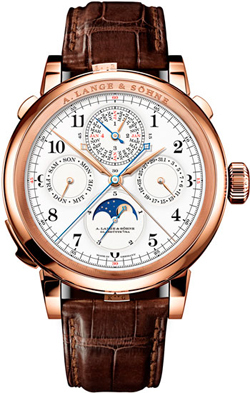 At the annual Salon of Haute Horlogerie SIHH 2013 the German company A. Lange & Sohne introduced another model supercomplex hours Grand Complication, equipped with three of the most practical and functional complications – perpetual calendar, split-chronograph and minute repeater. With split-chronograph can measure time intervals with an accuracy of 1 \ 5 seconds. The arrow shows the fraction of a second, combined with a moon phase indicator, located at 6 o’clock. 9, 12 and 3 hours are hand-type day of the week, month and date. And with a minute repeater A. Lange & Sohne Grand Complication not only displays the time, but the toll and a quarter hour bell. Watches are designed on the basis of the manufacturing Lange L1902 caliber with manual winding. Frequency oscillations of the balance of 18,000 pc / h (2.5 Hz), range – 42 hours. Screw mechanism with seven gold chatons designed and built in the workshops of the manufactory. Finishing done in accordance with the canons of Glashutte in Saxony and the requirements of Haute Horlogerie. Novelty is presented in a round case of polished 18K gold, size: 50mm x 20,3 mm. Offered in dark brown alligator strap with a folding clasp in rose gold. The creation of these highly complex model of care for a year. Hours will be reissued for 6 years on the same model (only 6 copies). Price of the new masterpiece of Haute Horlogerie 1,920,000 euros. According to preliminary data for 12 hours wealthy connoisseurs mechanics expressed their desire to buy watches A. Lange & Sohne Grand Complication. We can only guess as to who will have more luck!